I think about the best children’s picture book biographies out there and I notice a strange pattern. Some folks get what seems like a picture book bio a year. Einstein. Franklin. Mozart. Other folks remain strangely elusive. Where’s the quintessential picture book bio of Charlie Chaplin? Of Ernest Hemingway? Of the Mata Hari? Fact o’ the matter is, not everyone is cut out for a picture book bio. Sometimes a person’s life is just too difficult to synthesize into 32 pages, let alone something anyone could make kid-friendly AND honest. Extra kudos to author Tony Medina, then. With a big gap on my library shelf where Bob Marley’s biography should have been long ago, it’s nice to have something as lovely and enjoyable as I and I to offer the kids. Medina dances the dance of a man willing to tell the truth and nothing but the truth without having to get into the “whole” truth. No one can read this book and say it isn’t an honest bio of Marley. And what Medina chooses to say about the man is interesting to watch. On the day of his birth three little birds sang to him. 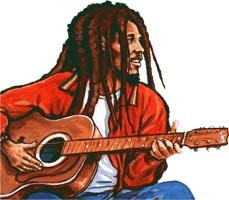 The son of a white British captain and a very young Jamaican woman, Bob Marley (born Nesta Robert Marley) was special. The local population believed he could read palms, and he did so gladly until his father called him to big city Kingston when he was six. While there, Bob discovered music for the first time and from then on his path was set. He pursued his love, eventually joining with The Wailing Wailers, before setting out on his own. 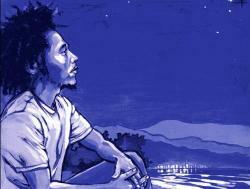 With Reggae and Rastafarianism close to his heart, he strove to bring peace to Jamaica. Cut down too soon due to cancer, his music and his memory live on in the hearts and minds of folks all over the world. Tony Medina is probably best known to children’s literature fans for his Love to Langston picture book biography of Langston Hughes. In other circles, he’s best known as an Associate Professor of Creative Writing at Howard University. He chose to write this book in verse, a fact that unnerved at least one person I spoke to. “If it’s in verse, shouldn’t it be in Marley’s lyrics?” I can see the point, but I couldn’t disagree more. Medina is careful to coax Marley’s life into seventeen free verse poems. Each one has a purpose and a rhythm to it. Each one advances the story. It will, I admit, take a bit of guts on the part of some adults to read aloud to book to large groups of children. The very first poem “I Am the Boy from Nine Miles” begins, “I am the boy / From Nine Miles / the one sing / Like three little birds / From my mum mum belly.” Kids will interpret this without difficulty. Grown-ups will take some coaxing. So what’s not in this book? Well, no mention is made of marijuana at any point, which is kind of funny when you consider the subject matter. Not that I’m surprised or anything. I doubt we’ll be seeing picture book biographies mentioning drug use for a good 200 years, minimum. Like any human being, Marley wasn’t a saint, so biographie-ing him up takes a bit of finesse. You don’t want to lie about his past, but at the same time you want to be honest with your child readership. Thank goodness for Afterwords! In this particular case, Medina is able to honestly say that Marley fathered eleven kids (that we know about) from a variety of women, and only three from his actual wife. Both that and the pot don’t make it into the main text either. Really, the book has found an interesting solution to the problem many picture book biographies face when trying to encompass an entire complex life with as few words as possible. While some titles prefer to give a rough gloss over the facts, leaving the explanations to the Notes or Afterword section at the end, I and I tells a complete story without the Notes’ help. Reading this book, the important thing is to get a gist of why this man is famous, why this man is special, and what happened to him over the years. So pot and random offspring, not being why we celebrate him, are moved to the backburner, while the rest of his life is on display front and center for one and all to see. It doesn’t make it any less funny that a Bob Marley biography is drug-free, but you understand the logic behind it. Jesse Joshua Watson first came to my attention when he illustrated Greg Neri’s fabulous Chess Rumble. With I and I, Medina may be the word man, but it’s Watson’s images that are going to get people to pick up this book in the first place. The man doesn’t muck around. In this book he employs thick, vibrant acrylics on illustration board. The cover says it all, really. A laughing Marley, all teeth and crinkly eyes and masses of hair upon hair. With this book Watson strives to bring Marley to the forefront at all times. Even when he’s nowhere to be seen (as with the image of Rita Anderson) you’ve the palpable sense that he’s just outside the frame, making her laugh. Watson works to get at the heart of each poem too. The contemplative Marley sits next to the poem “Pitch-Black Sky” considering his world. A similarly thoughtful Marley sits next to “Fate Opens Up Its Hand”, knowing now he has cancer. And most powerful of all are the eyes of six-year-old Bob, looking out the window of a bus, headed towards a father he does not know and who will ultimately abandon him once again. Those eyes stare scared, an arm covering his mouth, the image filling the whole page. And he’s only six. If have any problems with the book at all it’s not so much the images but the design. Because Mr. Watson fills his paintings to brimming with life and art and color, there’s no room for text. This means that the book is filled with black words on plain white spaces. There is no flow between the art and the language, and it stops you from getting wholly enmeshed in the story. Self-published books often make this mistake with their layouts. It’s a pity something couldn’t have been worked out with I and I to make the distinction between words and images less intense. The great thing about I and I is the sheer amounts of joy it exudes. It doesn’t gloss over the sad or unhappy elements of Bob’s life, but it does place him within the context of his times. 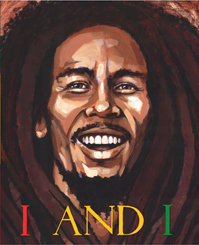 As a revolutionary and a poet-musician, Marley deserves a book that can display him at his best. And since I actually have heard children singing his songs in my library, I’ll bet you dollars to donuts this book will find its audience. It’s a story for everyone, and best of all it’s true. Source: ARC sent from publisher. There’s a great interview with Mr. Medina at Bowllan’s Blog as part of her Writers Against Racism series. For that matter, she also spoke to Jesse Joshua Watson. Back in 2003 Mr. Medina was interviewed at the Black Issues Book Review. In 2004 he paticipated in an NYPL live chat. Tony and Jesse also answered questions about the book together. It’s Non-Fiction Monday. Abby (the) Librarian has the round-up! It also has a book trailer, like so. Your review certainly makes me want to have a read of this book (and put some good music on!). The illustrations look gorgeous. Wow, what a review, this book just went on my wish list, must have it soon! P.S. 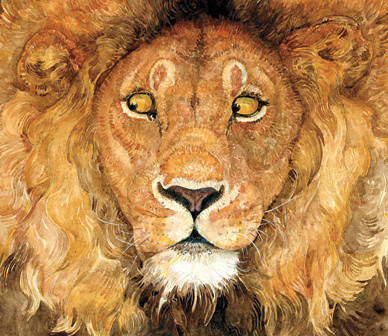 I love your positioning of the covers, the Lion looking at Marley! Wonderful to see such a thorough and insightful review of a picture book bio that heaps on due praise but pulls no punches. As a clinical social worker specializing in addiction issues with teens–and an upcoming author (JIMI: Sounds Like A Rainbow; Clarion, fall ’10)–I’ve given much thought to detailing drug use within a picture book text. In JIMI, I speak about it in the Author’s Note, since it has no place in Jimi’s own childhood story. In my lengthier (48-page) picture book on John Coltrane (Clarion, fall ’11), it is an essential part of the story, leading to the spiritual revelation which inspires John’s recovery, and which infuses his musical journey from that point on. Perhaps the only way to speak about drug use with kids IS honestly, to defuse the mystery, allure, and misconceptions. In that way, seen against the backdrop of a person’s very human life and troubles, drug use becomes another struggle, one that we can deal with honestly and hopefully overcome. Kudos to Tony and Jesse!